The Centerville-Washington Park District is celebrating the start of spring with an exciting geocaching adventure challenge in the Smith Property area of Bill Yeck Park! The cache stages will be themed around the past, present and future of the Smith Property. The first 50 participants to find and log all 6 caches will win a CWPD official geocaching.com trackable, and will be entered into a drawing to win a $25 gift card from geocaching.com! Limit one entry per family. The drawing will take place on Friday, May 20. 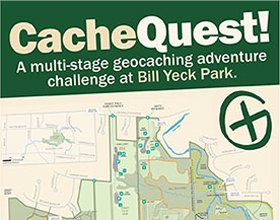 CacheQuest is a multi-stage challenge, with the coordinates for each cache found in the preceding cache. The first set of coordinates were released on March 20, 2016 on geocaching.com. Participants will need to sign the log book at each cache, log their finds on geocaching.com, and also keep a record of each cache’s title and coordinates for proof. Only the first 50 participants will receive a trackable.